In April 2012, on behalf of Electrotap (Jesse Allison and Tim Place) I got to sit down and chat with Perry Cook, professor emeritus at Princeton University. We met while Louisiana State University was hosting the first Symposium for Laptop Ensembles and Orchestras (SLEO). I had to opportunity ask him about the origin of laptop orchestra, the origin of the use of hemispherical speakers, the expansion of other handheld musical devices, his musical background, how his curiosity sent him back to school, what he does when he wants to chill. Cook: “Let’s see, I don’t know. Chilling out for me is cooking, which I always like to do, and so I cook a little more than I used to have time for. And where I live in southern Oregon is a really rich local farming area. So there’s pear orchards and apples and all sorts of that kind of northwestern stuff. But there’s lots of hippie farmer families that grow organic food and there’s organic beef and lamb and then there’s llamas– they make sweaters with and things like that. So it just a nice, cool area. It’s not the kind of Oregon that most people associate with Portland and the coast where it’s really rainy, so weather’s nice. And so ‘chilling out’ for me is cooking and eating and composing. Actually thinking about music that, you know, I want to listen to or create. Still building interfaces. Part of my process of moving all of my stuff from multiple states to this one complex in Oregon that I have now is fixing a lot of my old instruments. The stuff that I built years ago, some of them remarkably, I get them out and they still work. Some of them I get out and they don’t work at all, and I get to try to figure out if they ever worked. Also, I must add that for me, I’ve always been of the nature that if I don’t create some kind of music and write some code and solder at least once a week I get kind of squirrelly. So, I love to solder, I like to make my own cables and fix my own cables and fix my instruments. And I love to write code. I write code a lot. Just because for me it’s expressive, and cool, and interesting and sometimes I’m trying to answer questions that people ask me about ChucK specifically, and other languages. And sometimes I’m trying to hook together systems to see some new feature or Processing or some new library is useful for laptop orchestras or interactive things. And I’ve got a whole list of old projects lab notebook: installations I want to do and art works I want to make, so I’m usually thinking about those. Cook: “Yeah, I sang from as young as I can remember. I grew up Baptist in Missouri and so church choir singing as a little bitty kid. And I entered my first talent show when I was like seven or eight and won– singing and playing baritone ukulele that my mother had taught me a song and I would play it. So I was always, my mother and my grandmother, that whole side are big kind of performer people, so I inherited that from them for sure. And so singing was always a big deal, and then keyboards were a fairly big deal. We had a piano and an organ. My brother, seven years older than me, played and he taught me a few chords when I was young and I was off and running. And then I took piano lessons, and I played in every band and sang in every choir and acted in theatre. I wasn’t real sporty, I actually was able to count marching band as a P.E. credit. So in high school I got out of having to run around the track and vomit with the P.E. team by marching for miles and miles carrying a trombone. Cook: “Yea and so I did that and then basically the studio kind of captivated my attention so much that I ended up not finishing my music degree at that time, in that decade. And went off and started working for a company that owned a lot of theaters around Kansas City. And so I was a sound engineer. And did some studio work and a lot of live sound stuff. And did that for 5 years and then realized that I really wanted to go back and figure out mathematically what acoustics was about. What the Fourier transform was. So I knew that they would hire consultants who would come into one of our theaters and they’d bring a spectrum analyzer and the spectrum analyzer would tell them what to do, and I wanted to know what was up with that. So I went back to school at UMKC to get an engineering degree. And, sort of peripheral to getting that whole new degree in engineering, I was able to finish my music degree. And then by that time I was kind of spoiled for having any kind of real job, and so I applied to graduate schools and got into Stanford and went to Stanford as an EE PhD student but did almost all of my work in CCRMA. And hung out there for ten years, four and a half of them getting my PhD and the other five and a half doing things around the Bay area including singing a lot. I sang with the California Bach Society, I sang as a soloist around a lot. Did a bunch of early music records that were released as a CD series on Lyrachord. Did a lot of engineering. Cook: “I don’t know. I never have known this idea of the long-term vision or being a futurist and predicting. It’s funny because the great futurists is they’re quoted quite often like Ray Kurzweil and stuff saying, ‘in five years speech recognition will be solved’. And the first time he said that was in the seventies basically. So we know that’s not solved. It’s solved to the point where you can find your luggage on United Airline without ever talking to a human as effectively as you can find your luggage at all. But it’s not solved. We don’t talk to machines and they understand like a good secretary would when we’re in a bad mood and we have a cold what we’re saying. So in general I hate being put in the position of a futurist. I find one of the ironies with the notion of a laptop orchestra is the word orchestra is fairly anachronistic for modern times. It’s used often as a gimmick or a tool to say it’s ‘a lot of something’. Which is kind of what the laptop orchestra, and the idea was that we’re going to have an orchestral model where we sit on a stage and each person has a speaker and they’re responsible for their own sound and they control their sound. And that’s kind of cool, but to the average person walking around in the street, they don’t, you know, most undergraduates at this university probably don’t know what an orchestra is. Really. They may never have been to an orchestra concert. And that’s sort of interesting. And then I think also the double-edged irony of the term laptop orchestra is I believe ‘laptop’ may become a term at some near date where it’s quaint as well. Cook: “That’s right, so Tulane, there will be no ‘TOrk’ because you’re right. But so at some point you see it go beyond that where it is not just this university, The Ohio State University Laptop Orchestra but it’s really kids doing this and allowing and enabling and encouraging. I think one of the cool things for me is to see how a laptop orchestra is educationally a really powerful thing. How you can get a really, really fuzzy arts majors to understand some engineering principles that they never would have tolerated a human being in the same room with, in the context of an orchestra or music making with your friends or for music credit. And to get some pretty hard, nerdy engineers introduced to some concepts like listening– critical listening, in real time. And, frankly, the socialization that happens with a well comported ensemble who have posture on stage and enter the stage in an orderly way where all wear the same black and stand at their computers and open and close them in a nice, formal way. That’s something that the engineers who are good musicians know, because a lot of the engineers end up being fiddle players or something like that. But the engineers who don’t or the science or the math majors or even the literature majors who’ve never been in an ensemble don’t know how to act on stage. It’s a really interesting thing. It’s always funny to me I have to be reminded every time I work with one of these new ensembles that half of those people maybe never have been to a concert like that, let alone have been on the stage. And they don’t know that it is not okay that the instant you quit making sound you can start looking around and waving at your girlfriend. They don’t know that that’s not– you know you’re really an actor playing a role in addition to that. And so in a way I think we’re, even as nerdy as the word ‘laptop orchestra’ sounds, we’re doing a lot to socialize a lot of students into what it means to be theatrical, into what it means to be in a performance, in an ensemble, in a group like that. So, I think that’s a pretty cool contribution, so I sort of see that as a good contribution of ours. I don’t know if it’s for the future or not. I really enjoy that Stephen [Beck] named this the ‘Symposium on Laptop Orchestras and Ensembles’. So it’s not now just orchestras, whatever that means, it’s ensembles so for me that means choirs. And that’s just augmenting the voice and doing cool things with the voice that really separate it from that orchestral tradition and put it in the singing space which has a whole different set of behaviors and common practices and things like that. And I think also that this stuff, again, from Smule starting with Sonic Vox, which was our first little app that processed your voice. Which is basically the effects built into ChucK that we wrote in ChucK, put on your phone. But the real success of T-Pain. If can let everybody who has never been to an orchestra concert, but they know what Auto Tuning is even if they don’t know the name of it they’ve heard it, and they know what it is. You allow everybody to do that, you suddenly have people singing into their phones who would never sing in public, unless they were really drunk. And karaoke used to be the breaker of those mores and people would go out, get drunk, or whatever and they do karaoke together. But T-Pain and Glee, our other app, allows you to do that in privacy and if you like share it with your friends. It’s a small subset of people who actually post, who say ‘I’m going to now share this on Facebook’ because they think it’s awesome. But it’s a bigger subset who email to their girlfriend or, you know, so it’s a private, very controlled share. So we’re getting more people to sing than would have sang. And I view all of this sort of as an outgrowth of the laptop orchestra idea because some of those original instruments of Smule came from notions we had worked out with the laptop orchestra. So that’s the future will be, I hope, more music making on devices that you’ve got anyway. his base and on his wife and everything in sight, and built speakers of all sizes. So Curtis is like one of these extreme people, who, if you do something he needs it bigger, so he built a speaker that was too big to pick up, ‘bubba’. And then he built one smaller, so he has a little ball with sensors and speakers all over it that’s called the ‘bubba ball’ (I think). So he started building these speakers, and then Dan and I found this weird company that made kind of space-age, bachelor pad, spherical speakers. 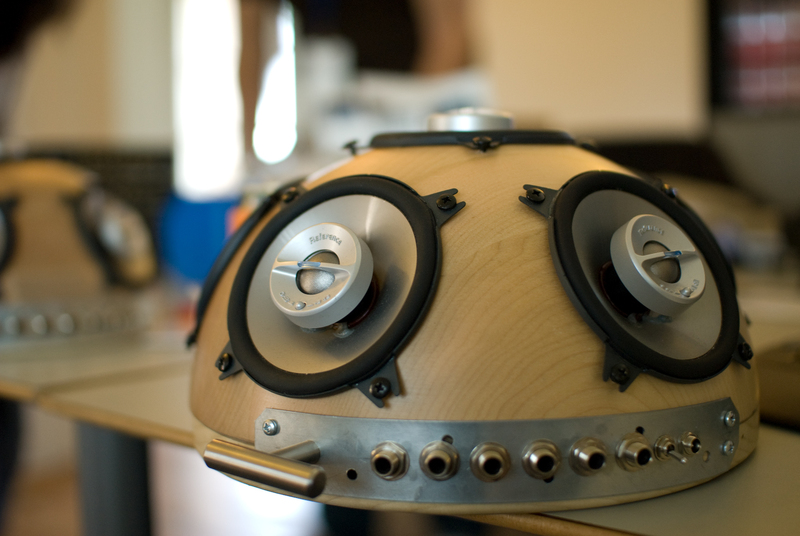 The speakers were spheres with one driver in them, fiber glass. And there are things there’s no diffraction stuff, and they look awesome. Cook: “Yea. I mean, our first PLOrk, we were told that we could get the most money out of the university if we offered it first as a freshman seminar. So which was just a really, really scary idea because we had no idea what we were going to get and we knew that it would be, you know, who knows? So at the minimal level you could teach them pieces. You could have cool things for them to play, and some of the canon, like CLIX is just fun. And you could teach them networking only to the degree that you say, ‘here’s an IP address’ and when you connect to the university’s wireless you can teach them a lot if you want to. If you want to convince the engineering school or the steam initiative people that you are really teaching concepts tell them how the university’s firewall doesn’t allow you to actually do the kind of stuff that you need to do CLIX, and that’s why you need to have to have your own router, which is insecure at many levels, but it allows you to do more stuff and you can tell them why it’s a whole ‘computing in your life’ sort of story. Send them out to collect sounds. So give them each, or if they’ve each got a laptop tell them to take that out and record an animal. And do a piece based on their animal sounds, and make them edit those sounds. And so you’re teaching them a little bit of, a lot of stuff actually, and discussions can be had about field recording and noise and audio formats and why mp3s are good or bad. Or why you can’t use them for the laptop orchestra or whatever. And so you can have that whole kind of big discussion about that. And as I said, I had told him that I think one of the great contributions about our laptop orchestras are you’re socializing a lot of people who have never been to an orchestra concert– they’ve never been to a proper theatrical event possibly, some of them. And they don’t know that it’s not okay to wave at your mom and pick your nose on stage just because you’re not making sound at that instant. And to do that whole idea that you guys dress properly, and you have, you know it’s right. And you close the laptop at a particular time, and that must mean something.